Yachiyo Inugami, a cat-loving extrovert, and Suzu Nekoyama, a dog-loving introvert, are unexpectedly cast into a relationship on a day like any other. The pair find themselves drawn together through an inexplicable attraction of their opposite personalities. As they quickly begin to understand one another, Inugami's hardened resolve to gain Nekoyama's favor only leads to frenzied responses. Soon after their momentous union, the two begin to spend more time with one another, growing closer all the while. Their combined antics gain the attention of the mousy Mikine Nezu, a classmate of Inugami, and soon they join the "biology" club. There, they meet Ushikawa Ukiji, a passive, cow-like upperclassmen. Nezu and Nekoyama soon begin to build upon their relationship and a game of cat and mouse soon begins. Wild, explosive, and vibrant, Inugami-san to Nekoyama-san tells the comedic tale of two high school girls and their less-than-normal relationship. I actually found myself enjoying this show a lot this season. Although plagued with the issues that face a short this show proved to be really enjoyable. Because it's a short it's really hard for the story to really develop and due to the nature of the show with each episode as a stand alone it didn't seem to have much going for it. Although nothing special the art was cute and managed to stay out of the "generic" feel. This let the show rest on it's characters which is where it really shines. Again with the issue of shorts characters did not have a lot of time to develop but thats not to say that they didn't. The characters were all unique and I enjoyed the concept of each being attached to a different kind of animal. They all were interesting and fun. The sound wasn't stand out fantastic however the ending's melody and lyrics were cute and catchy and fit the show well. I found myself listening to it a number of times and enjoying the wordplay and humor as well as the upbeat melody. Enjoyment is something that is really subjective and I'm going to be biased here because I LOVE YURI. The light yuri in this was outstanding and although I was spoiled by last seasons Sakura Trick I still found it really cute and appreciative. I really enjoyed each episode with each one actually making me laugh. The best way to put it is they were just fun. This may be because I rate high but I really enjoyed this show. It's unfortunate that shorts tend to get lower ratings because they don't have time to expand on their plot but I had a blast watching each episode of this. I really wish that it would come back for a full cour with full length episodes. I'd recommend it to anyone who enjoys light yuri or slice of life. Now, I've been hearing a whole lot of people saying that anime shorts are becoming more and more popular in the anime industry, and this anime has finally led me to coincide this conclusion. Perhaps production costs to make 23 to 25 minute episodes for simplistic yon koma series like Yuyushiki just don't seem to make sense to the directors. Think about it--You can literally sum up this whole series in ONE episode if it were 24 minutes. So please think about that before writing off the series as terrible simply because the episodes are short. If you're looking for a heart warming series, you'll like this. If you're looking for a lighthearted, goofy, and all over entertaining anime, look no further. Inugami-san to Nekoyama-san is a about a girl who resembles a dog (and coincidentally loves cats) and a cat-like girl (who also-coincidentally-loves dogs). These two meet through a mutual friend, and thus begins our adventure. Each episode is about four minutes long, introducing a small conflict or setting, without getting into too much detail. I can't tell if there is really an overall story. Sure, each episode tells a different little story, but there's no real purpose to it except to make you laugh and squee at the cute yuri moments. It's a little bit impractical considering somehow each character is named after an animal, but it's fun and enjoyable this way. Also, this school is a literal farm crawling with attractive, flaming lesbians (sign me up). The constant introduction of new characters can get a bit annoying after a while and complicate the main characters' relationship. I'll give it a 5. Art is gorgeous and well animated. The characters are pretty and simple, just the style that's fitting for the story. The sound is very good. Voice acting is nice, the girls don't have annoying voices and the song at the end is worthy of singing along to each time. Art is a 9 and the sound is a 10. The characters are pretty stereotypical to the animals they represent. Through this, we could easily connect to the characters. This category definitely earned some bonus points by utilizing this although they had so short of a time to introduce the characters. I feel as though the story should have focused more on our main pair rather than continually introduce characters that had no real effect on the story. Good job, I'll give the characters a 7. I personally really enjoyed this anime. When you really analyze and rip it apart into these categories, yes, there are some mediocre points. But the purpose of the anime isn't to really make you think about all that. The purpose is to entertain with a good laugh, fun characters, cute relationships, and silly circumstances. It is a very good anime, and would recommend it to anyone who is looking for these things. Overall: 8. Inugami-san to Nekoyama-san is part of 2014's mass invasion of yuris, perhaps being the cheered champion of it. Each episode is three to four minutes long (+ opening & credits). 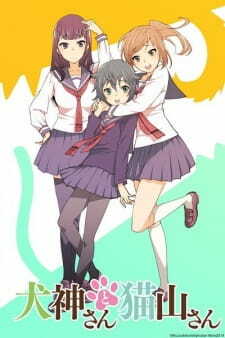 The anime is about the a school were apparently only female students go and being homo is a given (you will never see a male in the show).Inugami is an airhead that acts and looks like a dog and nekoyama a cute loli that acts and looks like a cat. They also have a friend who plays the role of the straight man, whose name is... Eeeh... Unimportant. What I can't explain is how the anime always kept me coming back for more. Yes it's stupid most of the time, the jokes aren't good and the atmosphere is so lovely dovely that it makes me want to puke. But somehow it keeps me yearning for more. I guess nekoyama's loli levels are to blame for this, since I find scenes she's not in rather boring. Overall if you're a fun of meru meru-level yuri I suggest it. When you don't have the time or energy to indulge in a long and complex anime, but still want to watch something, there are a number of fantastic short anime options to choose from. Here are 20 of the best, as chosen by Japanese netizens! Girls are said to be the most loving beings in existence, something that is true in real life and in anime. So what about girls who love other girls? Well that, my friends, is the definition of yuri anime. From just friends to more than friends, here are 20 of the best yuri anime of all time.